In 1964, hijackers working the New Jersey Turnpike were baffled when they ended up with a truckload of right-footed sneakers. The manufacturers figured they could frustrate the thieves by shipping half pairs of shoes--but the enterprising crooks started nabbing twice as many trucks and repacking the matched footgear in a mob warehouse. Unfortunately, this is one of the few colorful stories in the book, which is big on bluster and short on substance. 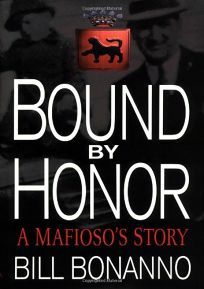 Bonanno must have hundreds of chewy anecdotes, yet his only apparent goal is to exalt the world of his father, mob boss Joseph Bonanno (referred to repeatedly and without a scintilla of irony as ""the Angel of Peace""), whose noble, European-style family opposed the drugs and prostitution championed by upstart Americanized mafiosi. His memoir will attract some interest because it claims to reveal the identity of the ""real"" JFK assassin, a hit man named Johnny Roselli who, by claiming to have fired from a storm drain on Elm Street, qualifies for membership in an alumni association now numerous enough to fill Dealey Plaza. Such overblown claims are just part of a bloviating style windy with references to ""our tradition"" and ""our world,"" phrases that would have struck a more resonant chord in the mid-70s, when Mario Puzo's books and Francis Ford Coppola's movies introduced the country to the peculiar mix of honor and violence that Bonanno crudely celebrates. Photos. $100,000 ad/promo; audio rights to Simon & Schuster; author tour. (May) FYI: Bonanno is said to have inspired the character of Michael Corleone and was the subject of Gay Talese's Honor Thy Father. A 60 Minutes segment will air near pub date, and a Showtime miniseries is planned.